My little pumpkin turned a half a year old last month! In true mom of a third child form, I have sucked at posting her updates. But, hey I’m only a month late on this one! This sweet baby girl just brings so much joy to our home and our family. Half a year ago, I met the last child I will have. I met the one who would complete our family. She’s the one that made Corbin a big brother and Lynley a big sister. She’s the one who gave us the experience of a singleton versus twins. She’s the one I will baby forever. It’s all going by so much faster than it did with the twins, and I’m trying to remember to hang on to every moment! 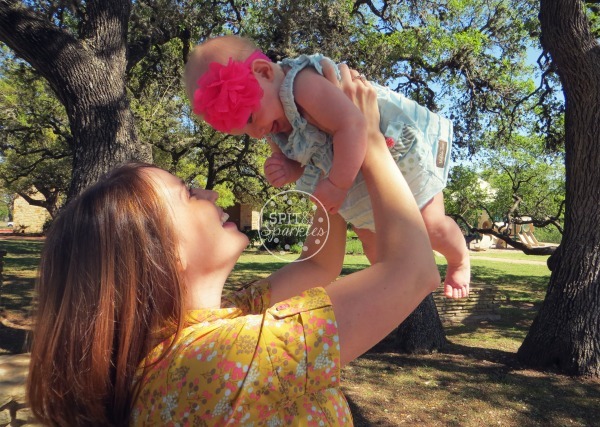 Here’s the skinny on Miss Harper… she’s a chubby, little thing in my eyes but everyone says she’s tiny except for those big, blue eyes! She weighs around 16 lbs and is 25.5 inches tall. She’s filling out her 6 month clothes, wearing size 3 diapers and feeding about 8 times a day still. We’ve made it 7 months strong breastfeeding, and I am so proud of us. After another rough start with breastmilk oversupply, forceful letdown and colic, I almost threw in the towel! But around 4 months, we both really started to get into a groove, but that’s another post! She randomly eats some table food and baby food, but I haven’t put her on a meal schedule yet. 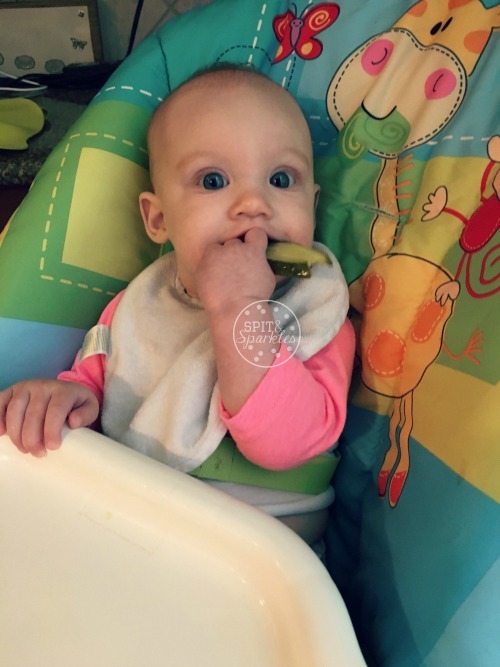 She’s not a fan of the spoon, so we’re trying a little baby led weaning along with purees. She really likes avocado. Bananas, not really. Pickles? Yes, LOVES them. I gave her a sandwich sliced pickle just to see her make a sour face, so the kids and I could laugh. But to our dismay, she just happily sucked and chewed on it. Sorry baby, you got me though! Harper loves to chew on her toes, laugh at her siblings, grab toys and try to eat them, and snuggling. She’s still the most snuggly baby ever! She still likes to be swaddled as well, which I am hanging on to. Score for me, one thing keeping her little! 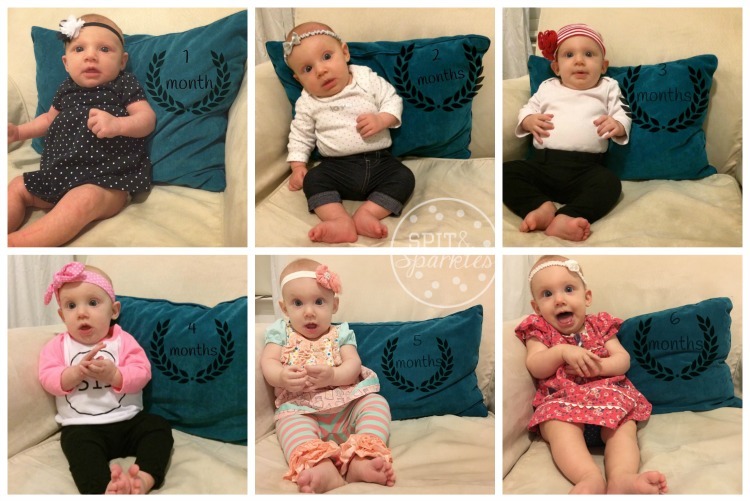 Harper can sit up, bring toys to her face, roll over both ways, and go from sitting to tummy. She is still madly trying to crawl. The other day I put her down for tummy time and walked away just a minute or two to get something for the twins, and when I checked on her she was across the room! She had scooted herself backward, Crawfisher 2.0! Corbin used to do that too, and it was hilarious! I actually thought she would be crawling by now, but I kind of stopped giving her so much tummy time cause I didn’t want her to. I know, bad mom. But, she loved to practice sitting up, and she loves to practice grabbing and holding toys, so there. We’re still working on her skills! And she absolutely loves practicing her bounce! Harper will sit in her exersaucer and bounce forever just giggling and smiling! I also thought she’d have a tooth by now, and sleep through the night by now. It’s a crazy cycle for both! Her gums will swell a little, and she’ll gnaw on things like crazy for a couple of days, but then… nothing. Ugh! This is how Lynley was with her teething. It took months. Sleep is the same. A few days she’ll sleep 6 to 8 hours straight, and the next few days it’s back to wanting to nurse every 3 or 4 hours through the night. Some sleep training is in order, but mommy and daddy are so tired, she just gets what she wants! Now, I fully understand why the youngest child is always so spoiled. Cause, we just want some peace and quiet. And the truth is, I like cuddling with her in bed. Corbin and Lynley started sleeping through the night when they were 5 months old, and have never been back in our bed. I would love it if they would come jump in bed in the morning and snooze with me for an extra 30 minutes or so, but they won’t. They won’t nap with me either. They will snuggle for a movie, so there’s that, but my little pumpkin will snuggle up anytime! Hanging on to that! My precious girl, you are so loved. Your calm spirit is so refreshingly beautiful. You have a little bit of your brother in you and a little bit of your sister. You’re laid back and calm like Corbin, but have a fierce determination about you like Lynley. It’s so fun to watch your personality develop. I love the way you want to be near us. I love the way you laugh at your siblings and give the biggest smiles when they talk to you. I love the way you make them laugh with your endless raspberries and rambles. It’s the sweetest thing to watch the three of you loving on each other. I am in love with your baby legs that are so chubby and kissable. I can’t stop myself from nibbling on them, and you can’t stop yourself from laughing when I do. I love your big blue eyes always looking around with wonder. You are so happy all of the time. People always ask me if you ever cry. Yes, you do, but only when you’re really sleepy or really hungry. You were born ready to explore this world, and have always been so alert and curious. You want to be in the middle of the action, and if someone walks by you and doesn’t say hi, you definitely let us know not to forget about you! Never, my darling. You are too special! I love you so much more than you will ever know. « Keeping Little Girls Little! Oh my sweet little roly poly!!! I love those chubby legs and giggles too! Can’t wait to see you soon!!!! Nini loves you!!! !